1.First of all you may have to download vmware workstation. 2.the second thing is to download linux version, you may have to choose between its different flavours. If you don't know what is this then its similar to that of windows, likely to be there are different versions of windows such as windows 7 home, professional, ultimate, same in case of vista and xp too. So, i have compiled a list of different linux favours along with there download link, click the one which you want to get, each flavour is unique in its own. 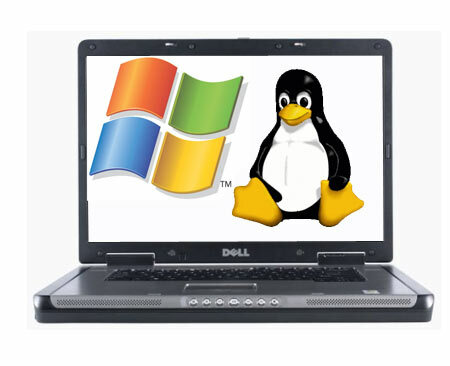 3.You have to setup VMWare to communicate with Linux. You need to do this by downloading a file from Wolphination.The following is the direct link: OS.zip. After you download OS.zip extract its contents to your C: drive. You should now have C:OS. Inside the OS folder I want you to put your version of Linux. So on my computer, inside C:OS I have OS.VMX, OS.vmdk, and FC-6-i386-livecd-1.iso (this is shown above in pic). We are almost ready to run Linux for the first time. 4.The fourth step is to setup your VMWare configuration file. This file is called OS.VMX you need to right click on this file and select “Open with…” and choose Notepad. On the line that says ide1:0.fileName “C:Your file” you need to change this to point to the Linux version you downloaded. So in my case it would get changed to C:OSFC-6-i386-livecd-1.iso. Now resave the file and you are ready to go. Click on OS.vmx and VMWare will open and Linux will start. It may take a minute or two for Linux to fire up (depending on how much RAM your computer has). So thats it we are done. In order to put it on desktop you may have to create shortcut of OS.VMX. Now double click that shortcut whenever you want to run. Linux will be more usefull in this way by giving shared space. This process is really easy to set up in case of Xp, similar in 7 or vista also. The first thing you need to do is to create a “New Folder” name it as linux data on your Windows desktop. Right click on the folder and choose “Sharing and Security>>”. On the following screen, choose “Share this folder on the network>>” and “Allow network users to change my files.” This will let Linux read and write to the folder.In Linux, go to Places >> Network Servers and you should see your computer. Double click on your computer and you will see all your shared folders. Any data you would like to be used in both Linux and Windows should be saved into this folder.